We are delighted to present the newest addition to Digital Special Collections & Archives: The Journal of Patrick Lynch. 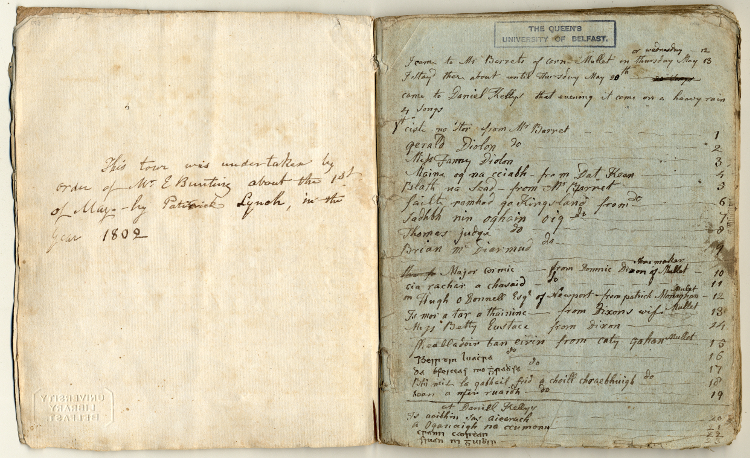 This important notebook from the Bunting Collection (MS4) charts the journey of Irish-speaking scholar and song collector Patrick Lynch as he travels through Ireland in search of songs, in the summer of 1802. Edward Bunting is well known in Irish traditional music circles as the first significant collector to work in the field. A classically trained organist from County Armagh, Bunting was employed to write down the tunes played at the Belfast Harp Festival of 1792 by the eleven harpers who gathered there at the Assembly Rooms in Waring Street. He devoted much of the rest of his life to the collection of these old Irish tunes. However, while Bunting was an accomplished musician and notator, he had no Irish language and could not therefore record any of the song words. Thus, in 1802 Patrick Lynch was engaged to set out on a tour of the country to write down the words of songs. Bunting followed after, collecting the tunes. Lynch’s diary, available now in full with transcripts on Digital Special Collections & Archives, describes a trip through Connacht, centring particularly around Mayo. Lynch travels from town to town, locating singers and noting down their song words — sometimes in the houses where he lodged and sometimes in the public houses, supplying to the musicians many a nagin, quart and pint along the way. While he receives kind assistance from many people, he also encounters obstacles including bad weather, flooded rivers and dwindling funds. He is regarded with deep suspicion by some locals. A tiny note in Gaelic script is written in the margin of page 018. A similar note was spotted at the bottom of page 074. Pitiful is a person without a friend in a foreign place without money. Indeed, by this stage in his journey, Lynch was broke (all those pints?) and his requests for help to his employers (the McCrackens in Belfast) had gone unanswered. He suspected his letters had been suppressed by an ill-disposed postal worker. Lynch collected almost 200 songs on his journey, and many of these were intended for inclusion in Bunting’s revised edition of his A general collection of the ancient Irish music in 1809. However, Bunting withdrew all of Lynch’s work from publication after Lynch, along with others, was forced to give evidence at the trial of their mutual friend Thomas Russell in 1803. Russell was executed by hanging at Downpatrick Gaol in October of that year. Other manuscript items by Patrick Lynch can be found in our Bunting Collection, and several of these are available in Digital Special Collections & Archives.